Today I'm on my way to Austin to attend the wedding of one of my sorority sisters. This is my first trip back to Texas since we moved to Boston, and I'm so, so excited to be back and celebrating such an exciting event! To say that packing for this trip was a challenge would be an understatement. The weather in Boston this weekend is supposed to get below freezing...and in Texas it's supposed to hit record high heat. I ended up just throwing stuff in the suitcase and praying it was under 50 pounds and appropriate for the weather. Thank goodness it was under the weight limit, but whether or not the contents are weather appropriate is still to be determined. Now that fall wedding season is fully underway, I thought I would do a little post on some fun numbers to wear while celebrating! 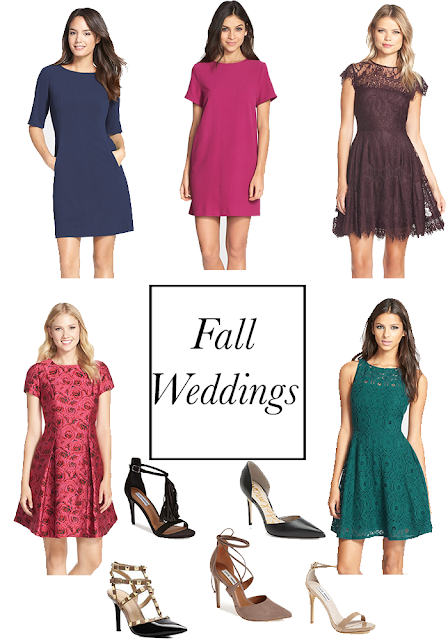 I'm all about adding functional pieces to my closet, and wedding attire is no exception. Wedding attire can get really expensive, especially if you're in or attending multiple weddings during a season or year, so getting the most wear out of each item is really important! I usually keep a few dresses in my closet for different types of weddings, because there is nothing worse than running around looking for a dress to wear the day before. Fall weddings can be extra challenging, because you never really know what the weather is going to do. It could be hot, cold, windy or rainy and you've got to be prepared for any and all of the above. I let the formality of the event dictate what type of fabric my dress is, with heavier fabrics for more formal and lighter fabrics if the event is more casual. I tend to gravitate towards a short length dress because they're the easiest to wear and can be worn for lots of different things after the wedding! To top off my fall wedding look, I usually pack a shawl or wrap in case it gets cold, one of my favorite clutches (shoulder straps are a bonus! ), and a killer pair of shoes! I hope y'all have a fabulous weekend!